In this last video with Chris Seay (see all of our previous videos here, if you missed them), I ask him for practical advice and suggestions for teaching your children to become givers and to teach them to be grateful for what they have. Teaching our children to be givers is something that my husband and I so much for our own three children. And we’ve been encouraged to see that our oldest is definitely “getting it”. However, there are still many times when our children complain about having to give things up in order to give to others. And there are also other times when the entitlement mentality rears it’s head and, instead of being grateful, they are discontent. I asked Chris if his children complained throughout the 40-day fast from excess. He has a great answer for that question and some practical ideas that inspired me as I continue to try to instill a servant’s heart in my children. Interview w. Money Saving Mom Part 4 from Chris Seay on Vimeo. Have you been inspired by this video series with Chris Seay? Be sure to check out his website and read more information on his book here. And come back tomorrow because I’ll be hosting a giveaway for 10 copies of his book! I got this book as a Christmas present via Compassion International for being an advocate. 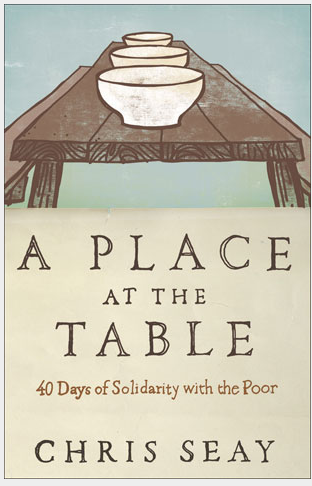 Lent starts tomorrow and I’m using the time to utilize this book and eat for the next 40 days until Easter, as the poor do throughout the world. It may mean everything from ramen, to rice, to tortillas, beans, or nothing. It’s going to be a journey. Thanks for showing this clip today! Yes, I vote for you to interview other authors. Very moving videos! This comment is unrelated to this post, but I just wanted to thank you for posting the Whole Foods one-day sale on the organic whole chicken! I was able to purchase one for myself and one for my parents who babysit my son. There is a Whole Foods very close to where I live (I rarely go there) and I roasted a whole chicken for the very first time! It turned out great (recipe from the Martha Stewart website). Thanks again. I have loved this series. I would love to see more! I loved this video series Crystal! It was so encouraging. I bought the book on Saturday and devoured it! Tomorrow I’m sharing it with my friends and family on my blog. I think it would be great if you had more interviews with authors. It is awesome to see people like Chris Seay, who are being the Lord’s hands and feet and making a difference! Thanks Crystal! Crystal, I just wanted to add that a lot of us respect your choices, we love hearing what the Lord has put on your heart to share and encourage us all. You too are His hands and feet. And through you, He has used you to not only help me stretch my dollar but stretch my faith! I love seeing your heart for others, especially in this series. keep up the great work! I’m not a parent, but I definitely enjoyed the video clip and vote for future video interviews. I love hearing about other authors and seeing these videos but to be honest, in my opinion, it shouldn’t be a main focus. I visit other blogs too and you tend to stick out because you are encouraging. Just seeing your meal plans, organization, routines, etc, makes me want to strive for the betterment of my family. Books included too. However, you don’t want to come across as someone who is constantly trying to promote a book. Don’t get me wrong, I loved this series, but look at the comments on your weekly goals, meal plans compared to a book review. So my vote is to keep them coming but remember why we are all here. I respectfully disagree because I think you also have tried to emphasize “expanding your mind” by reading books and offering up potential book lists for readers to explore vs “promoting” someone’s book. There are other “big picture” themes that have occurred with the videos on this author’s book. I think this author’s book theme fit in nicely with the second chapter of your own book and the theme of decluttering for the month of February. I also found the coinciding of the Lent season coming up and the desire of people to devote time to decluttering there homes in the Lent season and the theme of the author’s book timely as well. I think we are visiting your blog for many reasons but educating ourselves and motivating ourselves to be better home economists is not just about weekly goals, meal plans, or savings; it is about living a life that has meaning and fulfillment. Weekly goals and meal plans assist with making life easier but truly living a life of purpose comes from deep within a person and I believe that is where the motivation to write meal plans and develop weekly goals comes from and books that are meaningful to read and explore offer one avenue to develop that deep spiritual motivation to be a better home economist (plus faith :)). My two cents worth :). I wholehearitly agree with you Anna! I agree 100%, Anna! Your comment was right on with my thoughts! Well said!! Our society tends to instill what my Grandmother use to call: “gimmie, gimmie, gimmie, what do I get? ” When the answer comes back a warm bed to sleep in at night a pillow for your head….. It makes children start to understand greater what exactly they are always asking for. That said /think of how many times in one month we take a child to a store. How many things have we walked them past/ if they do not watch tv commercials they have less of the “gimmie’s” however, we adults have to realize as well if you walk a child through the candy store they are going to ask for candy. For all those who have ever read “If you give a mouse a cookie” Enough said. I agree with the previous poster. I, too, read a variety of blogs for different purposes – I enjoyed the interviews but I come to this blog for other information. In general, I’m not keen on reading promotions of any kind on any blogs. But you do a great job! Plus, I don’t like to watch vlogs. Too slow (I can read much faster), and as soon as my kids hear any sound they drop what they’re doing and come running . . . . I wouldn’t have minded reading the content, though. I really was curious as to what he had to say, but just didn’t want to take the time to watch it. But mainly I come her for the deals, etc. Not that I’m not opposed to a few other things thrown in, but if you really want to do a lot of that, maybe you should start another blog! And thanks for all you do, Crystal! Ha, Heather, my kids are the same way. It’s impossible to watch something without them ending up next to me. Haha. I appreciated this video post. Without it I would of never known of this book or Chris! I too read your blog for other things but no matter what you post I always find it encouraging. Sure, maybe not everything suits me or my family but the great thing is I can take what does. Or if it’s not for me I have friends who would benefit from what you post so I pass the info on to them. You won’t always meet all your readers needs but I wouldn’t change your blog! It’s been life changing for me personally. Thank you. Looking forward to hopefully meeting you next month. Exactly what I was thinking, Marie. Everything on this blog doesn’t suit me either, but I get more out of it than I skip over. Like you, I would not have heard of this man without Crystal and I was able to pass this along to my pastor. Thank you Crystal for opening my eyes to new things and also allowing all these comments. Sometimes I feel as if I learn as much from these comments as I do from the blog. I have two small children, so this is very helpful. And yes I like these videos, please keep them coming! It is VERY easy for a reader to just skip a post and continue reading those that appeal to that reader, so I do not think you should stop posting things (even book promotions) that you feel led to post! There’s no way to know the number of folks who are moved/motivated/encouraged by something you post who do NOT comment. Isn’t there some saying about how for every ten people who are pleased with something, perhaps only one will speak up and comment/compliment, but nearly every single person who is displeased will complain? Well, even if that’s not a popular “quote,” I find it to be the case. Keep doing what you feel led to do and know someone (probably more than just ONE!) benefits from your postings! And to the rest of the readers, I say skip on down to something else that does interest you! I like the idea of video interviews. I can understand what other people are saying about it possibly becoming just a promotion post for anyone who has written a book. Maybe you could mix it up. Interview some authors, some people who haven’t written a book but inspire you in your frugal/simple life or have had some impact on you in another way. It wouldn’t always have to be someone promoting a book but it could just be someone providing a new viewpoint or area of expertise. You could even interview people who have submitted popular guest posts in the past. I like videos and podcasts because I can let them play while I pick some things up or fold laundry. I think this is so wonderful!! I can’t wait to enter, I would LOVE a copy!! Such a great idea!!! I have loved this series. I especially love how they were broken up into smaller clips on one question/subject. It has given me a lot to think about. I think they have fit perfectly with your family mission and the mission of your blog. I would love to see more videos. I’m surprised that people don’t like the videos or your promotion of his book. If they don’t want to read that post or watch the video, it’s as simple as scrolling past that post. I choose your blog over others because of all the content that is NOT “deal” related. I come for books you read, home making ideas, projects and/or groups your family supports. Those posts are FAR more interesting than coupon deals. Thank you for supporting Compassion. We’ve adopted a child from Ethiopia & I love that you support & encourage others to help those less fortunate. Thank you for this post. We’re having a hard time with our 5 y/o right now in terms of some serious Gimme Gimme and behavioral issues. It’s hard to know how much this is normal kid stuff and how much of a problem we really have, if that makes sense. For Christmas he got what we considered an extremely extravagent present which which we thought was okay because it was pretty much all he got from us and my parents. But now I wonder if it was a mistake because all he talks about is wanting More More More. I talk to him all the time about gratitude and appreciating what you have but he’s a button pusher and has figured out what kind of response makes me angry. I try to keep perspective and realize I was likely that way when I was 5 y/o so maybe we’re expecting a maturity he’s not capable of. You are a good interviewer. But I would rather read about deals and steals, then hear author’s speak. One of the reasons I have extra money to give to others is because of you! Not only the deals, but the tips of budgeting, making do, etc., have helped our family’s finances. But it is not all about money! I appreciate the new books and authors that you mention–it helps encourage me to give more and be grateful for all that I have been given. Keep it coming, Crystal!